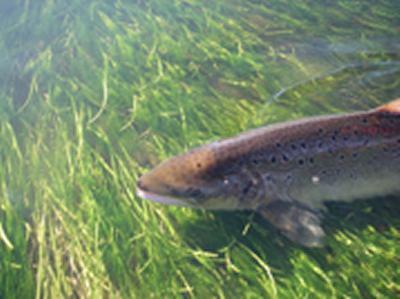 Where Atlantic salmon feed in the ocean has been a long-standing mystery, but new research led by the University of Southampton shows that marine location can be recovered from the chemistry of fish scales. Numbers of Atlantic salmon have declined across their range since the early 1970s and most researchers believe that conditions experienced at sea are largely to blame. Unfortunately, identifying where salmon go to feed in the huge expanse of the North Atlantic is difficult as attaching artificial tags to fish is expensive. A paper published this week (23 June) in Scientific Reports shows that fish carry natural records of feeding location hidden in the chemistry of their scales. "As every single salmon contains the natural chemical tag, we can now see where fish from individual rivers go to feed in the Atlantic," says lead author Dr Kirsteen MacKenzie. Co-author Dr Clive Trueman continues: "This information allows for better management of individual fish populations by monitoring both environmental conditions and fishing efforts in the areas where they feed." Kirsteen adds: "Our technique can also be used to aid conservation of animals such as turtles, seabirds and tuna, and identify the best areas for marine protection measures." This research was funded by Defra, (Department for Environment, Food and Rural Affairs, UK).